Fé mar a dúirt Micí Mac Gabhann fadó, is aisteach an rud an saol. Bíonn sé ag teacht thart mar a bheadh rotha mór, agus an té a bhíos ar bharr an rotha i mbliana is minic a bhíonn siad ar íochtar an rotha san athbhlian. 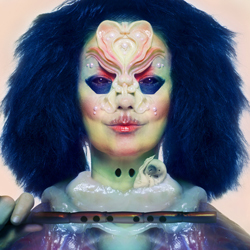 Tá a mhalairt fíor freisin; bhí Bjork in íochtar ar a halbam deireanach (Vulnicura, 2015), tar éis scaradh di ó athair a hiníne, ach mheasfá in uachtar í is tú ag éisteacht le Utopia. “We all are struggling, just doing our best / We’ve gone through the grinder, suffered loss,” a chanann sí ar ‘Loss’, agus más fíor sin is í an difríocht an babhta seo ná go bhfuil dearcadh níos dearfaí ag Bjork i dtaobh dhúshláin dhosheachanta an tsaoil. Ar nós aon tuismitheora eile sa lá atá inniu braitheann Bjork imníoch, ciontach, fiú, faoin phraiseach atá á leagadh aici ar an gcéad ghlúin eile, ach seachas géilleadh don éadóchas molann sí “Let’s clean up: Break the chain of the fuckups of the fathers” (‘Tabula Rasa’). Sin an pictiúr mór, ach tá an pictiúr beag ann freisin. Ní raibh Bjork ach leath ag magadh nuair a thug sí “my Tinder album” ar Utopia. 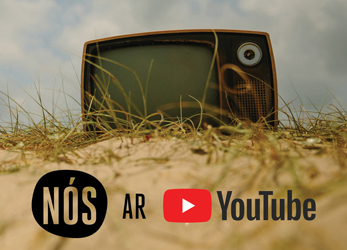 Cur síos ar thóraíocht útiopé an ghrá a bhfuil sa dornán amhrán a chuireann tús leis an albam. “Every cell in my body lined up for you / Legs a little open, once again,” a chanann sí ar ‘Arisen My Senses’. Cur síos é ‘Blissing Me’ ar “two music nerds” ag titim i ngrá is iad a roinnt mp3-anna lena chéile. Grá nó drúis, a Bjork? “All is full of love,” mar a chanais tráth, nó “all is full of lustful fantasy”? Deacair a rá, ambaiste, agus blas chomh láidir na fantaisíochta ar Utopia. Tá pailéad sonach an cheoil thar a bheith báúil do théama sin na fantaisíochta. Agus an léiritheoir Arca as Veiniséala (a bhí páirteach in Vulnicura) freagrach as na buillí casta agus fuaimeanna aisteacha leictreonacha, tá an-chuid ar siúl sa raon fuaime, ach bronann cláirseach Katie Buckley, ceol ó dhosaen fliúiteadóirí Íoslannacha agus guthanna an chóir Hamrahlid (a raibh Bjork féin ina ball de is í ina déagóir) gealas ar an gceol a d’fhágfadh duine faoi iontas ar an gcéad éisteacht. Nuair a éiríonn leis (‘Utopia’ féin agus an ‘Body Memory’ eipiciúil) tá sé ar nós bheith amú i Narnia teochreasach éigin agus éiníní róbatacha mar chomhluadar agat. Nuair nach n-éiríonn (‘Sue Me’) tá an iomarca ar siúl, agus amhránaíocht Bjork agus an ceol in iomaíocht d’aird an éisteora. Éisteoir aonair a bheadh i gceist, dála an scéil, mar nach féidir faic eile a dhéanamh is tú ag éisteacht le Utopia. Is fiú lán d’airde a dhíriú ar Utopia, ach, fós féin, geallaim nach mbainfidh tú deireadh an albaim amach gan ró-iarracht a dhéanamh. Saothar fíor-ealaíonta é, ach ceann atá timpeall 20 nóiméad rófhada, agus samhlaím go n-aontódh gach éinne ach deisceabail is dílse Bjork go bhfuil easpa éigin amhrán agus fonn láidre ann.